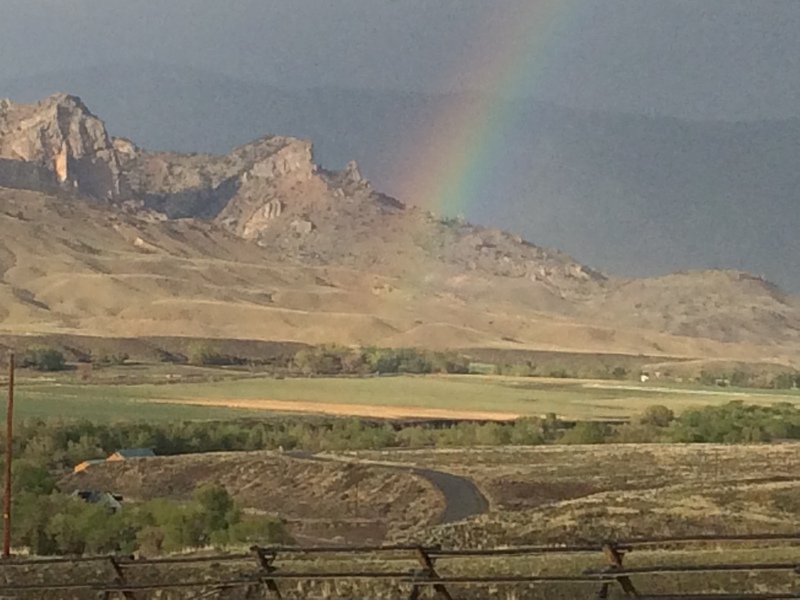 Spring has settled in with a few summer-like days here at Cody Wyoming. The weather has been fantastic with a few late afternoon thunder showers. I was working in the yard when a distant thunder shower produced this wonderful rainbow rising out of the lush green hayfields below. We’ve been busy at Windmill Inn getting ready for our visitors and the summer season, but had a little time to float the Shoshone River. The fishing has been tough with several hatches going off, so there’s plenty of food in the water for our trout to fatten up on. During our float last week we found the goose nest pictured above and witnessed several groups of parents with their goslings in tow. We had an antelope buck in the backyard of our bed and breakfast feeding on the new shoots of lush green grass. The real spring buzz has been the opening of Yellowstone Park last Friday. The opening of the East Entrance is Cody’s official kick-off to our tourism season. Our bookings are coming in steadily, so get your reservations in now before things are booked solid! !